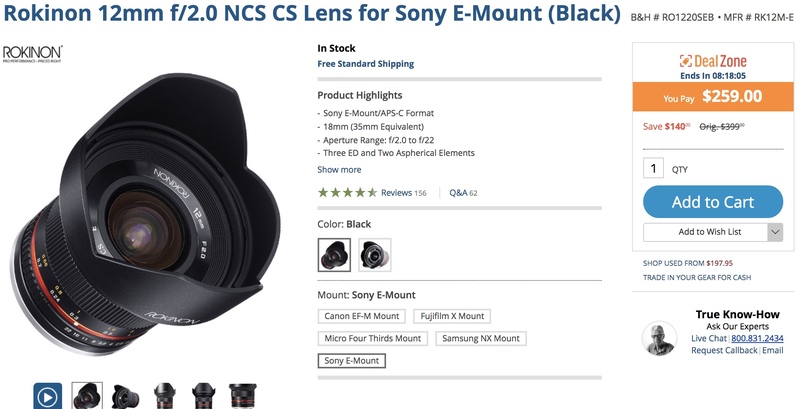 Today only B&H Photo has the excellent Rokinon 12mm f/2.0 NCS CS for Sony E-mount discounted. This is a great lens for Astrophotography if you’re looking to try something new. The fast wide Rokinon/Samyang lenses are some of the best out there for getting into astrophotography without breaking the bank. If you want to learn more about astrophotography join our Astrophotography Addict Group. This entry was posted in 3rd Party Lens and tagged Rokinon 12mm f/2.0 NCS CS. Bookmark the permalink. Trackbacks are closed, but you can post a comment.